Browning strength and protection in a built-in vault solution for your home. A collector’s must-have. Massive steel door. 22 locking bolts. Fire protection. Available with Chrome, Black Chrome, or Gold trim. Finishes include Black Cherry, Gloss Black, Hunter Green Metallic, Primer Black, Charcoal Metallic, and Titanium Metallic. The Browning Vault Door is the perfect solution for the person who has “more than a few guns” in their collection. 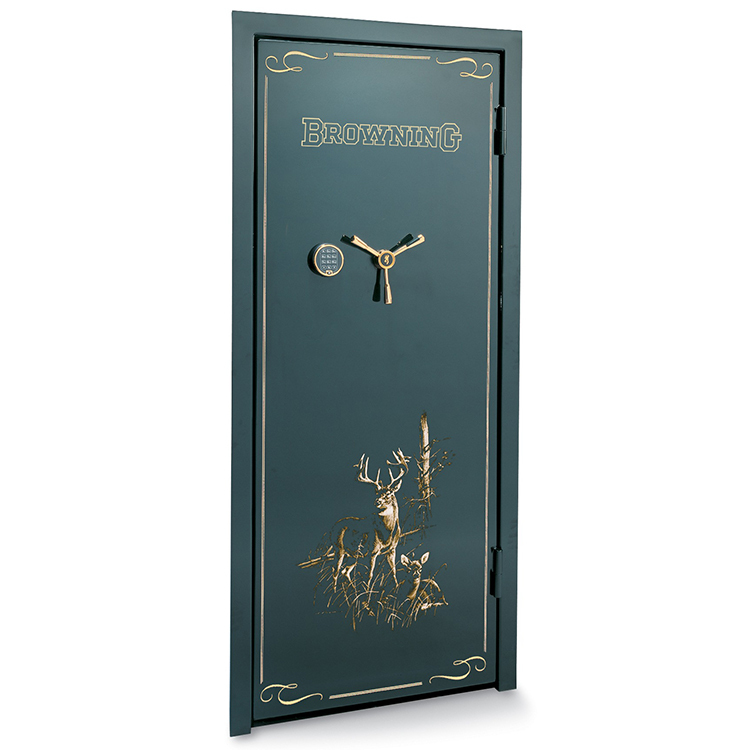 In fact, needing a Browning Vault Door in your home is a dream come true for many of us. 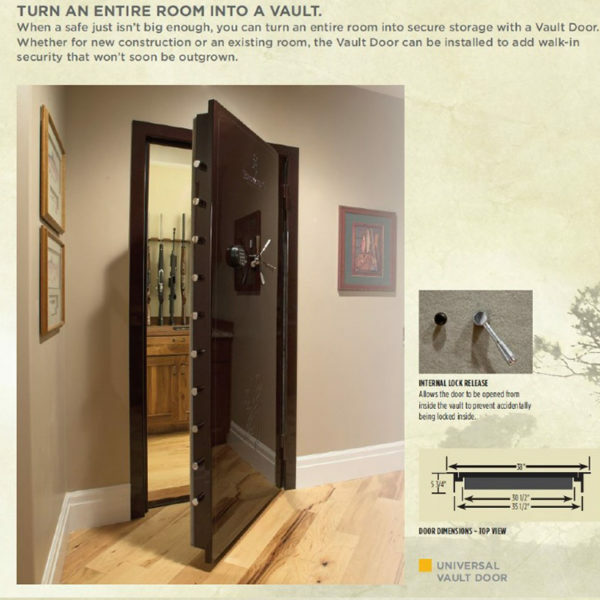 The Vault Door allows you to build a Browning level of security into a special room in your home or office. Browning Vault Doors don’t try to disguise the fact that a highly secure area is behind them. They are simply highly secure. Period! A properly built vault room allows you the greatest amount of latitude and creativity in the way your guns are displayed. For those of us with collections of unique and rare guns it gives the ability to show or display the guns without moving them in and out of a conventional safe, risking dings and scratches. 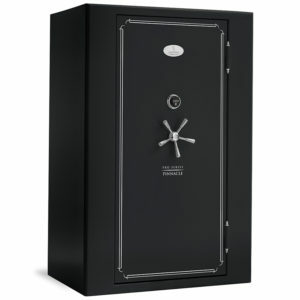 A vault room using a Browning Vault Door also adds greater versatility allowing safe and secure storage of expensive gear, documents, heirlooms and more. When all is said and done, for an extensive collection of guns, art or large valuables, a walk-in vault is the ultimate in convenience. 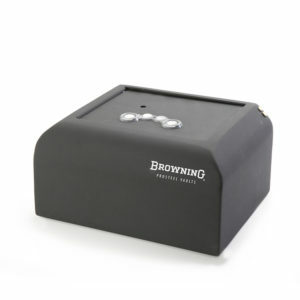 To finish off these built-in security areas, Browning clearly offers the finest Vault Door. 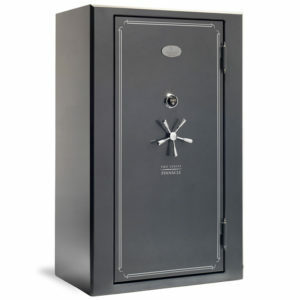 Vault Doors add strength and a “don’t tread on me” safe-like appearance to your home. Designed to fit a variety of wall types and installation requirements. The minimum rough door opening for the Vault Door is 83″ x 36″. The External L-frame with 1⁄2″ diameter steel J-bolt anchors (included) can be poured in place in new construction or installed in an existing door frame by using expansion anchors or lag bolts (not included). Features a door frame L-flange that will fit any wall with a minimum thickness of 5 1⁄2″.